When migrants leave to find work abroad, they often seek to improve the well-being of their family and provide better opportunities for their children over the long run. While migration may assist in achieving financial stability, research shows that the absence of a parent can be detrimental to a child’s social and psychological development. Children left behind are a vulnerable category unlike any other and deserve policy-specific attention. No part of the world remains untouched by the phenomenon of labor migration and its effects, and countries of the former Soviet Union (USSR) are no exception. The Commonwealth of Independent States (CIS) was established in December 1991 following the collapse of the Soviet Union. Current membership includes Armenia, Azerbaijan, Belarus, Georgia, Kazakhstan, Kyrgyzstan, Moldova, Russia, Tajikistan, Turkmenistan, and Uzbekistan. Ukraine left the organization in March 2014. Launched in 2009, the Eastern Partnership (EaP) is a joint initiative between the European Union and six eastern European partner countries: Armenia, Azerbaijan, Belarus, Georgia, the Republic of Moldova, and Ukraine. The initiative enables partner countries interested in moving towards the European Union to increase political, economic, and cultural links. A growing body of research suggests that the question of left-behind children and families is a pressing issue. Some studies, however, claim there is not enough evidence demonstrating that migration has a negative impact on the future development of children, and that parents typically choose to migrate only when there is a well-functioning caregiver arrangement in place. The research presented in this article suggests that more needs to be done to make claims to this effect one way or another. This article focuses on the impact of labor migration on children left behind, examining this phenomenon through a lens of economic, social, and gendered implications. The findings are discussed in the context of two countries of the former USSR: Moldova and Ukraine. Though the two states have taken different paths since gaining independence, they are united by their Soviet pasts and recent migration trends and policies. It is unknown how labor migration patterns and their impact on children will be affected by the current chaotic political situation in Ukraine. In Moldova, 100,000 children have been left behind by migrant parents; the country has become reliant on remittances, which equal nearly US$2 billion, almost one-quarter of gross domestic product (GDP), according to 2014 World Bank estimates. Ukrainian migrants, who left 200,000 children behind, sent home an estimated US$9 billion in remittances in 2014, the largest amount in the region, representing 5.4 percent of GDP. The scale of migration and the impact of remittances on domestic economies have prompted the governments of Moldova and Ukraine to partner with European Union (EU) Member States and international organizations to develop policies addressing the welfare of migrants and those left behind. The most important and timely question raised by scholars Ernesto Castañeda and Lesley Buck in the debate on labor migration and children left behind addresses the issue of who is actually raising the children of the developing world. Migration uproots a family’s stability and, as a result of separation, reduced care and resources may negatively impact the social and psychological development of left-behind children. Studies of the effects of migration on the well-being of Moldovan and Ukrainian children left behind generally find that children are negatively impacted emotionally. It is extremely difficult, however, to accurately assess the emotional state of left-behind children because most studies do not include their emotional state prior to the departure of a parent, nor is it possible to measure what the emotional state might have been in the absence of migration. Each child reacts differently; it is not enough to simply compare a child with migrant parents to one without. More factors must be taken into account before clear parallels may be drawn. Left-behind children face numerous adverse effects of parental migration including problems related to school, such as deteriorating academic performance, declining attendance, and a lack of motivation. In Moldova, 22 percent of migrants’ children do not attend school. Health concerns may arise, including drug use and undermined or deteriorating health, as children with migrant parents may not solicit help when needed. Family stability and future development are also at stake. Divorce is common among Moldovan migrants. Children left behind lack job opportunities and may develop psycho-emotional problems often associated with an inferiority complex. This can lead to youth unemployment and juvenile delinquency, with high rates of each in Moldova and Ukraine. Left-behind children are also vulnerable to human trafficking and labor exploitation. The development of a physically and emotionally nurturing relationship between children left behind and their remaining or new caregivers is a common challenge. Evidence shows that girls are twice as likely as boys to have a stronger bond with their new caregivers. In Moldova, research suggests that if the father migrates and the mother remains as the caregiver, the child’s relationship with the caregiver is not significantly affected. Conversely, when a mother migrates, only a small percentage of men become the primary caregiver; more commonly, the job falls to a grandparent. Thus, a mother’s departure is arguably more detrimental to a child’s development than a father’s migration. In the case of both parents migrating and the child being left in the care of relatives or friends, the distance between child and caregiver is even more significant. A lively debate exists over the benefits to children of parental labor migration. Many experts, although not all, claim the financial benefits that result from migration outweigh the social and psychological trauma caused by a parent’s absence. Remittances can improve a family’s situation, providing a larger income than available in Ukraine or Moldova, which migrant households typically use towards buying food and clothing, home-improvement projects, better health services, and education for their children. At the same time, remittances may contribute to economic inequalities within the origin community, creating a financial rift in the quality of care and opportunities for children in remittance-receiving households and those in households that are not dependent on such support. In some cases, remittances may be insufficient to support the needs of transnational families, as providing for two households—the left-behind relatives and those who migrated—leaves fewer opportunities to improve financial status. For some, remittances are used to cover basic everyday costs, leaving little money for home reconstruction or occasional luxuries and even less for investing in a child’s education and future. The positive impact of remittances on migrants’ households in Moldova and Ukraine cannot be overlooked, as remittances have helped alleviate poverty for many transnational families. Remittances can have a positive impact on school attendance, as well as health care. At the same time, they should not be regarded as a panacea for all the problems migrant households face. They are neither an instant nor a steady flow of income. In the short run, financing migration is expensive, with the initial departure resulting in significant costs, and returns not coming in until later. Many families find themselves in a worse financial situation, as remittances may be used to pay off debts. While remittances represent a significant source of income for many Moldovan families, research often disregards the fact that remittance-receiving families with children have debts that are five times higher than those of receiving households without children. In more than half of Moldovan migrant households with children under the age of 18, remittances comprised 50 percent of the family budget, a 2008 United Nations Children Fund (UNICEF) study found. Remittances create a certain dependency. Once a family makes the decision to become economically transnational, it is difficult and undesirable to return to a life without such receipts. Remittances may also have a negative impact on the receiving-country economy. With high levels of remittances, the Moldovan and Ukrainian governments have been reluctant to invest in public services such as schools and hospitals, assuming that those receiving remittances will use private services. Women comprise 48 percent of the international migrant stock worldwide, and as high as 70 percent in some countries. Many studies have found that maternal migration, which is growing, has a stronger negative impact on children left behind. However, women have generally been found to be more responsible migrants—remitting a larger portion of their earnings, keeping in touch more frequently, and staying loyal to their partners and families. Certain trends in the feminization of migration and rise in children left behind transcend national borders. This has led to the development of globally accepted policies on left-behind children, including bilateral discussions between states to establish comprehensive policies benefitting both sending and receiving communities. The growing number of children left behind amid the feminization of migration sets the stage for targeted in-country policies for monitoring and assisting transnational families, with a particular focus on migrant mothers and their left-behind children. With a population of slightly more than 3.5 million, Moldova is the second smallest country in the Commonwealth of Independent States (CIS). Thirty percent of its GDP is attributed to agriculture, and more than half of the population lives in rural areas. Although the country was severely impacted by economic hardship—mainly as a result of the dissolution of the Soviet Union—in recent years Moldova has been approaching middle-income status, according to the World Bank. Although economic stabilization over time has led to a drop in the poverty rate from 73 percent in 1993 to a little over 25 percent in 2013, Moldova remains the poorest country in Europe. More than 10 percent of the Moldovan population lived abroad in 2010, according to the International Organization for Migration (IOM). And the number of Moldovan migrants increased from 50,000 in 1999 to 385,000 in 2013, according to Moldovan Labor Force Survey data, though the number of migrants working abroad is significantly higher (more than 30 percent of the workforce) since many of the jobs taken by migrants are of a seasonal nature. The massive inflow of remittances plays a crucial role in Moldova’s economy, with one in three households receiving a share of the nearly $2 billion remitted via official channels in 2013. Historically, several important push factors explain the significant labor migrant exodus. Between 1990 and 1999 Moldova experienced a two-thirds drop in its GDP, mainly as a result of the fall of the Soviet Union, a civil war (1992-93), and the 1998 regional financial crisis. On the pull side, Moldovans are attracted by higher incomes and a wider range of job opportunities abroad, traveling to Russia and other CIS countries, Italy, Portugal, other EU Member States, Israel, and Turkey. Moldovan migrants constitute a diverse group; 64 percent are men (who mostly head to Russia and other CIS countries to work in construction), with the majority of women seeking work in Italy in the care and service sectors. In 2010, more than two-thirds of migrants came from rural households and were significantly younger than those from urban areas: 43 percent of rural migrants were between 20 and 29 years of age, contrasted with 32 percent of urban migrants, according to the Labor Force Survey. Nearly three-quarters of all Moldovan migrants leave the country between the ages of 15 and 39, with the average departure occurring between the ages of 20 and 24. As such a large percentage of the migrating population is in prime reproductive age and actively involved in the labor force, emigration causes a significant loss of human capital and reproductive potential. The number of children left behind is high: more than 100,000 children, according to a 2012 UNICEF report. In 2011, one out of every five children in Moldova had a parent living abroad, while 10 percent had both parents abroad. In Moldova, family structure is generally traditional, with the mother responsible for child-rearing. A mother’s absence is often more detrimental to a child’s development and the sense of abandonment is exacerbated; in 14 percent of Moldovan families with a migrant mother, the child perceived that nobody was caring for them, while only 3 percent felt this way in families with the father abroad. In 23 percent of families with migrants, no one took the children to the doctor, and in 10 percent no one was responsible for their education, according to the 2008 UNICEF survey. Moldovan girls with migrant parents performed significantly better at school than their male counterparts. In addition, children from migrant households tended to have slightly better grades than their peers, which may be attributed to an increased effort. UNICEF found that the increase in juvenile crime rates in Moldova between 1993 and 2000 was positively correlated with the number of children left behind, who accounted for almost 60 percent of juvenile offenders during that period. More recently, a 2012 UNICEF study found that the total number of children who come into conflict with the law decreased from 2,160 in 2006 to 1,586 in 2010. Of all the juvenile offenders in Moldova in 2010, nearly 90 percent were unemployed and not attending school and 20 percent had one or both parents living abroad. Left-behind children are undoubtedly a vulnerable social group in Moldova, deserving government and societal attention. Despite common public views to the contrary, the results of most studies on the issue do not suggest that parental migration has an alarmingly adverse effect on Moldovan children in most aspects of well-being. While children may be negatively impacted by the absence of their parents, Moldova’s poor economic conditions, particularly in rural areas, will continue to drive labor migration to Russia and the European Union. Recognizing this flow and the importance of remittances to the economy, the Moldovan government has initiated a series of policies designed to assist families with migrants abroad, as discussed below. The Ukrainian population declined 0.6 percent annually between 2000 and 2014. Simultaneously, the population is aging, with predictions that nearly half will be older than 45 by 2050, while nearly one-quarter will be of retirement age by 2025. The economically active population is strained to support those who are dependent. Unemployment stood at 9.3 percent in the first three quarters of 2014. In 2012, 3.4 percent of the Ukrainian population worked abroad, many temporarily, and an estimated 25 percent of Ukrainian labor migrants work abroad with irregular status. Over the last two decades, Ukraine has transformed from a country of relatively low mobility to a major migrant-sending state with one of the world’s largest diaspora networks. The top destination countries are Russia and EU Member States (Italy, Czech Republic, Poland, Hungary, Spain, and Portugal). Between 2010 and 2012, men represented 65 percent of all labor migrants, according to IOM. Ukrainian men, like their counterparts from other CIS countries, mainly work in construction (primarily in Russia), while most female migrants are employed in the domestic or service sectors (primarily in Italy or other Western European countries). Ukrainian migrants come from across the country, but due to a high degree of economic disparity between regions, the largest concentrations are from Uzhhorod and Chernivtsi, on the borders with the European Union. Remittances play an important role in the Ukrainian economy, reaching US$9 billion in 2014, the World Bank estimates, and 5.4 percent of the country’s GDP (more than foreign direct investment). Ukraine faces challenges due to endemic corruption, and remittances flowing into the social market may never go towards strengthening development on a nationwide scale. Yet at a household level, they may improve the material well-being of transnational families. While the share of female migrants has decreased in Ukraine over the last 20 years, the practice has been evolving. Ukrainian women are generally the first to migrate, are commonly divorced or widowed, and leave their children and families behind. Many studies have noted that remittances sent by Ukrainian women are highly oriented towards social spending and that women positively contribute to Ukraine’s development, improving social welfare and well-being. There are about 200,000 children left behind in Ukraine, according to the Ministry of Family, Youth, and Sport. In the regions most affected by immigration, nearly one-quarter of all children are raised by one parent. The majority are adolescents, an age when it is easier for parents to leave their children behind. Many studies find that children are most vulnerable during adolescence, and in the case of transnational families in Ukraine, many left-behind children experience abandonment and neglect, which could prove detrimental to their development and transition into adulthood. Juvenile delinquency in Ukraine appears more serious than in Moldova. The Ukrainian Independent Information Agency (UNIAN) reported that in the first six months of 2011, juveniles committed 11,781 administrative offenses, a nearly 60 percent increase over the same period in 2010. Street children represent the highest-risk group among juvenile delinquents, reports a Kyiv Center of Social Services for Families, Children, and Youth expert. While most left-behind children left behind do not become street children, many do, and further research is required to determine what share they comprise. In Ukraine, the initial separation between a child and labor migrant parent lasts from two to five years on average. Initially, many migrants do not have an official status in the destination country, preventing them from traveling home to visit their families. As a result, children left behind in Ukraine are commonly divided into two categories: those who are left behind but whose parents eventually return and those who are permanently abandoned. One in every five left-behind Ukrainian children is permanently abandoned, according to an IOM study, and the receipt of remittances does not solve the potential social and psychological issues caused by physical abandonment. Furthermore, while past labor migration from Ukraine tended to be temporary, in recent years permanent emigration has become more common. With the political and economic crisis Ukraine faces today, this trend is likely to persist. As more migrants find their bearings abroad, they tend to eventually summon their children. This may not happen at the moment of initial migration, but the desire of most successful migrants is to reunite with their children in the destination country, constituting a third category of left-behind children: Those in a state of limbo, waiting to be reunited with their parent(s) abroad. For Ukraine, this situation may create double losses. First, the country loses a member of the labor force and then their child, who may have joined the Ukrainian workforce and society, with proper government investment in educational and labor market opportunities. As a result of significant out-migration, the phenomenon of care drain is a serious concern. The family has traditionally cared for the elderly in Ukraine and across former Soviet countries; institutionalizing them simply was not done. This approach to elder care ensured care provision across generations: the elderly take care of the grandchildren and the household, while they themselves are cared for by their adult children. The migration of younger women results in a care gap, as their children are left with aging grandparents who are often unable to take over caring for the children, the household, and themselves. The issue of the elderly left behind exacerbates the challenges faced by the left-behind children and creates an additional strain on already fragile household economies. Moldova-specific migration policies did not exist under the Soviet Union. The first law on migration was adopted following Moldovan independence in 1991. In 2001, the government established the State Service for Migration. Although the service was envisioned to provide social protection to migrants and deal with other problems related to temporary employment abroad, it failed to address the full spectrum of migration issues. In 2002 the Law on Migration was passed, followed by the National Action Plan on migration and asylum in 2005. The problem of the left-behind was first sounded in 2004 during the creation of the National Poverty Reduction Strategy, when the former National Bureau of Migration made proposals to evaluate the social costs of migration. Not seen as a priority at the time, the proposals were rejected. Projects within the framework of potential Moldovan accession to the European Union focused on migration control and regulation, but paid little attention to the social impacts of migration and disregarded left-behind households. Under the 2010-11 National Action Plan of Moldova on the protection of children left without parental care, a partnership was created among the Ministry of Labor, Social Protection, and Family (MLSPF), Czech Development Agency, IOM, UN Fund for Population, and the State University of Moldova in order to build a comprehensive body of research to help create meaningful policies addressing the issues of left-behind children, families, and the elderly. The European Union in 2011-13 funded a project to minimize the negative impact of migration on children and other family members left behind, the first multilateral undertaking of its kind in Moldova. The project provided direct assistance to 400 children left behind, job training to 100 youth, and advice on starting a business to 213 young people (48 of whom received in-kind grants). Training was provided to 130 social workers and 47 vocational school employees. Aid was also provided to migrants in Italy: 1,000 Moldovans in 12 Italian cities became part of a campaign raising their awareness of the negative impacts of migration and more than 100 Moldovans received psychological, social, and legal assistance. The project was implemented by the Italian and Moldovan governments, in coordination with various nongovernmental organizations, diaspora associations, and IOM in Italy and Moldova. Source: National Committee for Combatting Trafficking in Human Beings, “EU Helps Hundreds of Moldovan Families Address the Effects of Migration at Home and Abroad,” (news release, September 20, 2013), www.antitrafic.gov.md/libview.php?l=en&idc=94&id=235&t=/Press/News-and-Events/EU-HELPS-HUNDREDS-OF-MOLDOVAN-FAMILIES-ADDRESS-THE-EFFECTS-OF-MIGRATION-AT-HOME-AND-ABROAD. Corruption and poorly organized policies often make it impossible for Moldovans to access services to which they are entitled. Even though there are some useful social support networks, migrants are often unaware of such services and access is usually left to the discretion of local authorities, who commonly decide that migrants’ children are not eligible to receive their entitled benefits. Government recognition that children left behind are a vulnerable at-risk group is one of the first steps to raising awareness among professionals who deal with them and developing policies to respond to their needs. Children in transnational families face neglect, stigmatization, and social exclusion, but with new aid projects (see Box 1) their needs are starting to be addressed. In 2012, MLSPF and partners carried out a census of children left behind. The results are being used to develop policies to further strengthen social protection for these children. At the moment, work on issues of children left behind in Moldova continues, albeit at a slow pace, but the government has made little measurable progress concerning left-behind children since the 2010-11 National Action Plan. With the current political situation in Ukraine—separatist violence throughout the eastern part of the country, internal displacement and flight, Ukraine officially quitting the CIS in March 2014, and overall instability—it is impossible to predict the effect on labor migrants and their children. Many of the policies concerned with left-behind children pertain to Ukraine’s cooperation with the European Union. On the one hand, this means that mutual projects and policies may not be negatively affected, as the European Union continues to have a vested interest in Ukraine; on the other, migration flows to Russia will be heavily impacted. There are lessons to be learned from Ukraine’s experience if CIS countries are looking for a success story on how to begin addressing issues of migration and children left behind. Several projects have been launched in recent years to monitor migration flows from Ukraine to Italy, as it is such a common destination for Ukrainian women, who comprise 80 percent of Ukrainian immigration to Italy. Projects initiated in Ukraine, in 2009-10 in collaboration with IOM and the Italian government address job creation and reduction of pressure to migrate; training, recruitment, and selection of workers for the Italian labor market; support for the voluntary return of migrants; maximizing the value and directing the flow of remittances; and intercultural development programs. Programs also include transnational welfare initiatives to support left-behind children and migrant parents, and to provide training for psychologists, caregivers, parents, and school teachers to better address the needs of the left-behind and migrants themselves. Domestically, Ukraine has moved to provide better services for those affected by migration. In 2007 a joint ordinance from the Ministries of Education, Public Health, Family and Youth, Labour, and the Interior encouraged the main social service providers to improve collaboration and to consider families separated by migration as potential beneficiaries of services created more generally for families in difficult situations. Moreover, in 2007 the Ministry of Education and Science required practitioners who work with children to pay attention to the special needs of children of labor migrants. Consequently, in 2008, a law was proposed requiring migrants to name a temporary legal guardian prior to departure, which has still not passed in Parliament. While migration issues have stagnated in government institutions, some local and international nongovernmental organizations (NGO) have started their own projects with social orphans, including left-behind children. These include the Association of Ukrainian Working Women in Italy; the Kolping Family NGO of Lviv, which provides long-distance therapy over Skype with mothers abroad; the Suchasnyk NGO in Chernivtsi, which supports trafficked children; and the Ternopil Centre for Migration Advice. The Italian Ukrainian Observatory on Migration, piloted in 2009, is a joint effort coordinated by IOM, involving the participation of representatives at the international and regional levels, NGOs, and research organizations from both Italy and Ukraine. The participants developed a decentralized plan of action, out of which emerged the project discussed in Box 2. The Capacity Building Action towards Ukrainian Local Institutions for the Empowerment of Migratory and Social-Educational Policies on Behalf of Children, Women, and Local Communities project, coordinated by IOM, is composed of three distinct parts: a psychosocial-educational component, which includes training, creative labs, and guidelines for teachers; an institutional dialogue component; and an initiative to address the empowerment of Ukrainian migrant women. Various approaches were suggested for school teachers and school psychologists, such as specific teaching activities and workshops to get children left behind to talk about the psychological trauma they face as a result of their parents’ departure. Examples include but are not limited to story workshops, a migration “corner” in school libraries, narration workshops for children, sports workshops, communications projects (such as teaching to use and making access easier to technologies like Skype), and training sessions for migrant parents, who have either migrated or are planning to migrate. In addition, focus groups involving more than 100 Ukrainian women were organized in Italy to address the psychosocial impact that migration has on Ukrainian female migrants working in Italy and how their relationship with their children is affected. Three dimensions were addressed: the migration process in general, social-cultural integration, and transnational mothering. Sources: Claudia Zaccai and Rossella Celmi, eds., Transnational Families: Pedagogical Guidelines for Teachers (Rome: IOM Italy, 2010), www.childrenleftbehind.eu/wp-content/uploads/2011/11/Pedagogical-Guidelines-for-UKR-teachers_IOM-Italy.pdf; and Cristina Montefusco, Final Report: Capacity building action towards Ukrainian local institutions for the empowerment of migratory and social-educational policies on behalf of children, Women, and Local communities (Rome: IOM, 2010), www.childrenleftbehind.eu/wp-content/uploads/2011/11/Final-Report-ITA-UKR-project-IOM-Italy.pdf. In 2009 Unicredit Bank’s Unidea Fund launched an initiative in Ukraine and Italy to provide support for families left behind in the former and help Ukrainian migrants in the latter. Centers in Italy provide support to migrants and families separated by migration, offering psychological help, labor orientation, and legal consultations (in coordination with the NGO Soleterre, located in Milan). Additionally, in 2008, Unidea funded a project coordinated by the Consorzio Gino Mattarelli consortium, under which Italian centers assist with the recruitment of nurses and family assistants from Poland and Ukraine, setting up a platform for developing social enterprises in Eastern European countries. In addition, the Fund provided for six Ukrainian newspapers printed in Italy. These projects offer cultural and psychological links to home for migrants. Support for migrants in the destination countries is essential in addition to providing support to the families left behind in Ukraine. Migration patterns, numbers, and development levels are different in Ukraine and Moldova, but the countries are united by a Soviet past difficult to shake 20 years after the USSR collapsed. In both countries the children and elderly left behind are a group of rising concern. Recent policies adopted in Moldova and Ukraine are coming closer to addressing and dealing with the negative effects of labor migration on families. While the Moldovan and Ukrainian initiatives present a targeted approach to addressing the issues of migration and the left-behind, the most difficult task is getting the respective governments to take on a bigger role in reforming the migration system from within. Possible policy actions include strengthening public bodies and empowering civil society to create and carry out services for vulnerable families, including children left behind, as well as integrating social services to work with migrants and their families. In order to improve the well-being of children left behind, the governments could provide training to psychologists, social workers, and teachers who work with migrants, children, and families left behind. To leverage the benefits of migration, some have suggested Moldova and Ukraine continue to positively reinforce the links between migration and development, by promoting small businesses, creating job opportunities for adults, and work and educational exchange programs for young adults, including the children of migrants. Corruption is one of the major stumbling blocks in Moldova and Ukraine, limiting the effectiveness of migration and development policies. It permeates nearly all levels of society and all aspects of life and until it is addressed at the root, it will be difficult to achieve significant results within the migration-development nexus and beyond. Moreover, the deterioration of relations between Russia and Ukraine prevents the establishment of long-term goals and threatens the livelihood of migrant families. The effects of the political situation on migration, and the children of migrants, are unknown. Anderson, Kirsten. 2012. Reform of the Juvenile System in Moldova. Chisinau, Moldova: United Nations Children’s Fund (UNICEF) and Swedish International Development Agency (SIDA). Available Online. Antman, Francisca. 2013. The Impact of Migration on Family Left Behind. In International Handbook on the Economics of Migration, eds. Amelie Constant and Klaus K. Zimmerman. Northampton, MA: Edward Elgar Publishing Ltd. Available Online. Atamanov, Aziz, Matthias Luecke, Toman Omar Mahmoud, Roman Mogilevsky, Kseniya Tereshchenko, Natalia A. Tourdyaeva, Ainura Uzagalieva, and Vitaliy Vavryshchuk. 2008. Income and Distribution Effects of Migration and Remittances: An Analysis Based on CGE Models for Selected CIS Countries. Warsaw: Center for Social and Economic Research (CASE). Available Online. Barbone, Luca, Mikhail Bonch-Osmolovskiy, and Matthias Luecke. 2013. Labour Migration from the Eastern Partnership Countries: Evolution and Policy Options for Better Outcomes. CASE Network Reports No. 113/2013. Warsaw: CASE. Available Online. Castañeda, Ernesto and Lesley Buck. 2011. Remittances, Transnational Parenting, and the Children Left Behind: Economic and Psychological Implications. Latin Americanist 55 (4): 85-110. Cheianu-Andrei, Diana, Rodica Gramma, Stela Milicenco, Valentina Pritcan, Virginia Rusnac, and Dorin Vaculovschi. 2011. Specific Needs of Children and Elderly Left Behind as a Consequence of Migration. Chisinau, Moldova: Ministry of Labor, Social Protection, and Family of the Republic of Moldova. Available Online. European Union External Action. N.d. Eastern Partnership. Accessed December 16, 2014. Available Online. Gassmann, Franziska, Melissa Siegel, Michaella Vanore, and Jennifer Waidler. 2013. 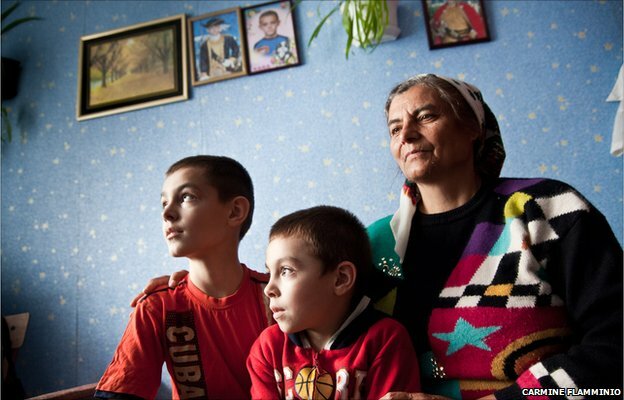 The Impact of Migration on Children Left Behind in Moldova. Working Paper #2013-043, Maastricht Economic and Social Research Institute on Innovation and Technology (UNU-MERIT), 2013. Available Online. International Organization for Migration (IOM). 2014. Moldova: Facts and Figures. Last updated September 2014. Available Online. ---. 2014. Ukraine: Facts and Figures. Last updated September 2014. Available Online. IOM Mission in Ukraine. 2011. Migration in Ukraine: Facts and Figures. Kiev, Ukraine: IOM Ukraine, September 2011. Available Online. ---. 2013. Migration in Ukraine: Facts and Figures, Second Edition. Kiev, Ukraine: IOM Ukraine. Available Online. Italian Ministry of Labor and Social Policy. N.d. Addressing the Negative Effects of Migration on Minors and Families Left Behind in Moldova. Rome: Ministry of Labor and Social Policy. Available Online. Luecke, Matthias and Tobias Stoehr. N.d. The Effects of Migration in Moldova and Georgia on the Children Left Behind – Country Report: Moldova (draft). EuropeAid Project: DCI-MIGR/210/229-604. Kiel, Germany: The Kiel Institute for the World Economy. Available Online. Montefusco, Cristina. 2010. Final Report: Capacity building action towards Ukrainian local institutions for the empowerment of migratory and social-educational policies on behalf of children, Women, and Local communities. Rome: IOM. Available Online. National Committee for Combatting Trafficking in Human Beings. 2013. EU Helps Hundreds of Moldovan Families Address the Effects of Migration at Home and Abroad. News release, September 20, 2013. Available Online. Parrenas, Rhacel Salazar. 2005. Children of Global Migration: Transnational Families and Gendered Woes. Stanford, CA: Stanford University Press. Piperno, Flavia. 2007. From Care Drain to Care Gain: Migration in Romania and Ukraine and the Rise of Transnational Welfare. Development 50 (4): 63-8. ---. 2010. Migration and Development between Italy and Ukraine: The Road to Decentralized Co-operation. Rome: IOM. Available Online. Salah, Mohamed Azzedine. 2008. The Impacts of Migration on Children in Moldova. Working Paper, Division of Policy and Practice, United Nations Children's Fund (UNICEF), New York, October 2008. Available Online. Siegel, Melissa and Matthias Lucke. 2013. Migrant Transnationalism and the Choice of Transfer Channels for Remittances: The Case of Moldova. Global Networks 13 (1): 120-41. State Statistics Service of Ukraine. N.d. Macroeconomic Indicators. Accessed January 22, 2014. Available Online. Tolstokorova, Alissa V. 2011-12. All Girls’ Best Friends? Care Migration and the Care Diamond in Ukraine in the Context of Population Ageing. Vienna, Austria: ERSTE Foundation Fellowship for Social Research. Available Online. Ukrainian Independent Information Agency (UNIAN). 2011. Juvenile Delinquency Takes Dangerous Proportions. October 11, 2011. Available Online. United Nations Children's Fund (UNICEF). 2007. Children and Migration. Global Forum on Migration and Development, Belgium, 2007. Available Online. World Bank. 2013. Migrants from Developing Countries to Send Home $414 Billion in Earnings in 2013. News release, October 2, 2013. Available Online. ---. Moldova Overview. Accessed October 12, 2013. Available Online. Zaccai, Claudia and Rossella Celmi, eds. 2010. Transnational Families: Pedagogical Guidelines for Teachers. Rome: International Organization for Migration (IOM) Italy. Available Online.